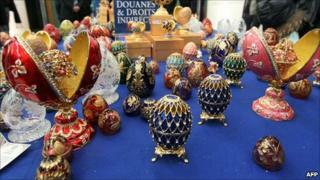 French customs officials say they have seized some 350 fake Faberge eggs, which were intended for sale during the busy Christmas season. The counterfeit copies of the famous Faberge collection were discovered in a cargo coming from Russia at Paris's Charles de Gaulle airport last month. Faberge confirmed the eggs - which were displayed at the airport - were fake. Faberge created some 50 jewelled eggs for Russia's imperial family starting in the 1880s. The eggs were commissioned in the Russian Orthodox tradition of exchanging decorated eggs for Easter. They have since become synonymous with luxury.